The Socorro parakeet (Psittacara holochlorus brevipes), endemic to Socorro Island has long been treated as a subspecies by several authorities while others considered it to be a full a species based on different types of evidence. We reviewed the phylogenetic placement of the Socorro parakeet using molecular techniques adding newly derived information from several fresh and museum specimens to available sequences in GenBank. We obtained revised phylogenies from NADH dehydrogenase 2 (ND2) and cytochrome oxidase I (COI) mitochondrial genes. Maximum likelihood and Bayesian phylogenetic analysis recovered the phylogeny of Psittacara. This clade has strong support for both genes and taxa within the clade show reciprocal monophyly. Based on this phylogenetic placement and geographical isolation, we recommend recognizing the Socorro parakeet as a distinct species (Psittacara brevipes). Psittacara h. rubritorquis should be treated as a distinct species as well. 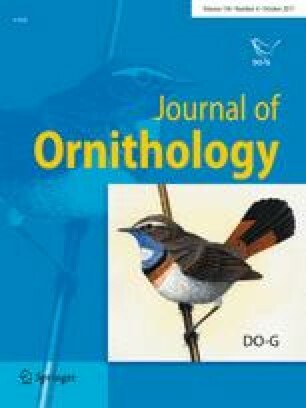 This taxonomic arrangement also will draw more attention to this parakeet from the conservation community considering the restricted distribution and small population size of the Socorro parakeet. Der für die Insel Socorro (Mexiko) endemische Socorrosittich (Psittacara holochlorus brevipes) wurde von verschiedenen Quellen lange Zeit als Unterart behandelt, während weitere ihn auf der Grundlage anderer Belege als eigene Art betrachteten. Auf der Grundlage von aus Frisch- und Museumsmaterial neugewonnenen Daten sowie vorhandener GenBank-Sequenzen führten wir mittels molekularbiologischer Techniken eine Neubewertung der phylogenetischen Einordnung des Socorrosittichs durch. Wir erstellten überarbeitete Phylogenien für die mitochondrialen Gene für NADH-Dehydrogenase 2 (ND2) und Cytochromoxidase I (COI). Durch phylogenetische Analysen (Maximum-Likelihood- und Bayes’sche Methoden) ermittelten wir die Phylogenie der Gattung Psittacara. Diese Klade wird statistisch gut gestützt, da sowohl Gene als auch Taxa innerhalb der Klade reziproke Monophylie zeigen. Auf der Grundlage dieser phylogenetischen Einordnung und der geografischen Isolation schlagen wir vor, den Socorrosittich als eigenständige Art (Psittacara brevipes) anzuerkennen. Psittacara h. rubritorquis sollte ebenfalls als eigene Art behandelt werden. Diese taxonomische Stellung wird dem Socorrosittich, eingedenk seiner beschränkten Verbreitung und der kleinen Populationsgröße, auch von Seiten des Artenschutzes mehr Aufmerksamkeit einbringen. The Mexican Navy provided generous logistical support that allowed sampling of individuals used this study; we particularly thank Admiral F. Jiménez Colorado, Captain D. Castro Castro and naval personnel stationed at Socorro Island. We are grateful to M. J. Navarro Sánchez, Reserve´s acting director of the Biosphere Reserve, and Lieutenants A. Lechuga Medina at the Naval Oceanographic Institute, J. Cervantes Pasqualli, for their invaluable field assistance. We sincerely appreciate R. Alonso at Facultad de Veterinaria y Zootecnia (UNAM) for providing samples of P. h. holochlorus. We sincerely thank the Administration of the Federal Insular Territory at the Ministry of Interior (SEGOB) for supporting research on Mexican islands. Financial support was provided by the Island Endemics Foundation, Endémicos Insulares AC and the Instituto de Ecología AC (INECOL). This research was conducted under permits DICOPPU/211/2158/10 (SEGOB) and SGPA/DGVS/06778/10 (SEMARNAT) granted to JEMG. We followed ethical standards for the use of animals in scientific research.